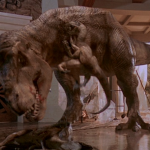 The Big One and her subordinates are a trio of Velociraptors that formed a pack from the remnants of the eight original Raptors that were introduced to the Park on Isla Nublar. 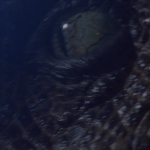 Due to the physical appearance of the three Raptors being identical, we at Jurassic Park Legacy are unsure precisely which Raptor is the individual that Park Warden Robert Muldoon refers to as “The Big One”. 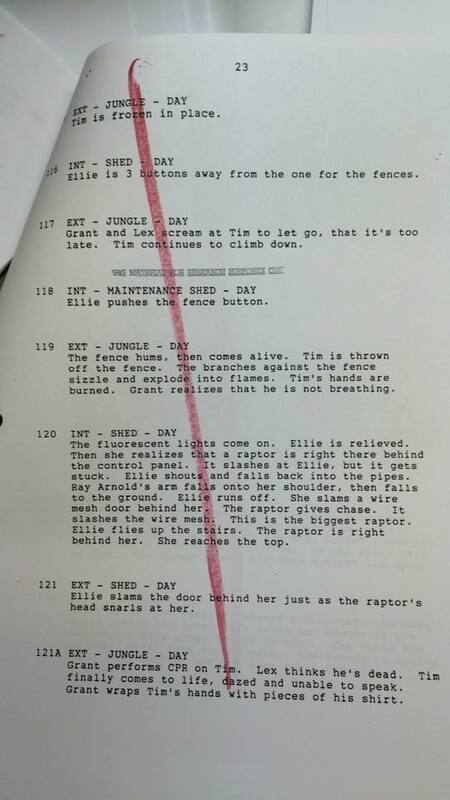 Recently it was uncovered from Rick Carter’s collection of documents from the first Jurassic Park regarding the continuity breakdown that the female in the Shed that attacks Ellie is The Big One. We don’t know exactly for sure if this applies to the final film though. 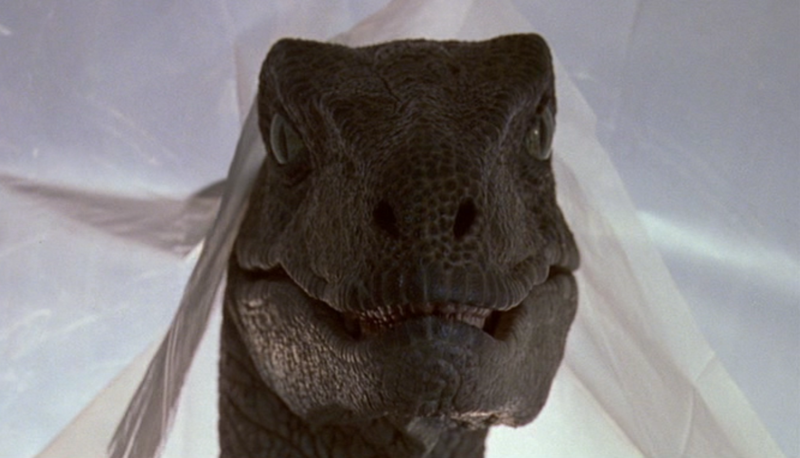 Originally InGen bred eight Raptors for Jurassic Park: Isla Nublar. 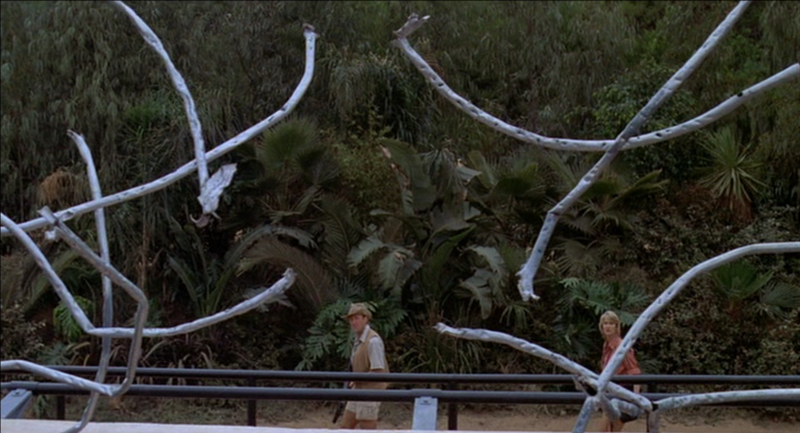 However, after The Big One’s introduction to the Velociraptor Paddock, this particular Raptor either herself killed or had killed, all but two of the other Raptors. After taking charge, The Big One would repeatedly have her subordinates attacking the paddock fences when the feeders came along side their systematic testing of the paddock fencing in search of a weak spot. The led to the Raptors having to be relocated to their own special containment pen. 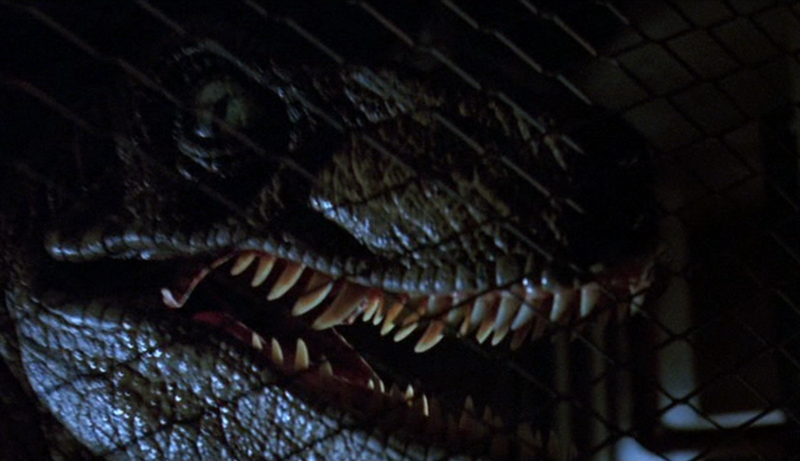 In the early summer of 1993, a Raptor was introduced to the Raptor Pen. 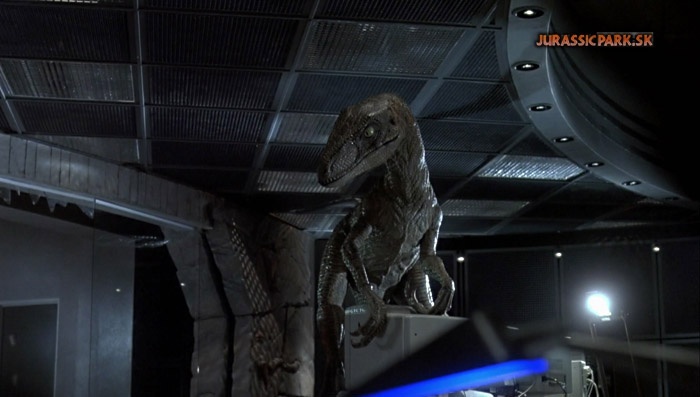 During her introduction, the Raptor mauled and killed a worker during an attempted escape. The details surrounding this particular Raptor are unknown. It is unknown if this particular Raptor was The Big One, one of her subordinates, or a new Raptor. It is also unknown whether this Raptor survived her mauling or whether she was killed. 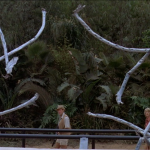 Due to the aforementioned Raptor’s attack and killing of the worker Jophery, John Hammond‘s investors, represented by Donald Genarro, shut down a majority of construction on the Park and demanded that an inspection crew be allowed to give their endorsement. The investors threatened to pull their funding if Hammond did not comply. Putting together a team of endorsers comprising of himself and chaotician Dr. Ian Malcolm, investors also requested vertebrate paleontologist Dr. Alan Grant due to feelings of Dr. Malcolm being “too trendy” as Genarro put it. Hammond, who had been funding Dr. Grant’s work, personally recruited Dr. Grant himself, who was accompanied by his colleague and paleobotanist, Dr. Ellie Sattler. 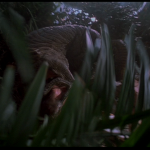 After the endorsement team made a quick tour of the Isla Nublar Visitors’ Center, the hatching of a baby Raptor led Dr. Grant to request to see the adult Raptors. Unfortunately for Hammond, however, the group’s encounter with the predators coincided with one of their feeding times. Much to Hammond’s chagrin, the group watched with a mixture of interest and disgust as The Big One and her subordinates tore apart a cow, leaving nothing left but a shredded and blood splattered harness. 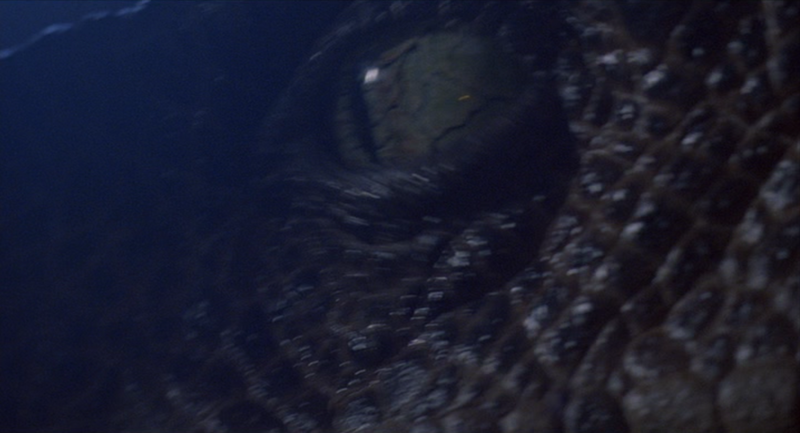 At this point, Robert Muldoon took the moment to briefly tell the group a short history of the trio, though neglected to mention the escape attempt that was the cause for the group’s presence. While the group was on tour, accompanied by John Hammond’s two grand children: Lex and Tim Murphy, computer programmer turned corporate spy Dennis Nedry sabotaged the Jurassic Park computer system, which led to the Isla Nublar Incident. During the shutdown, John Hammond had Ray Arnold immediately check to ensure the Raptor pen was still electrified, which it was. 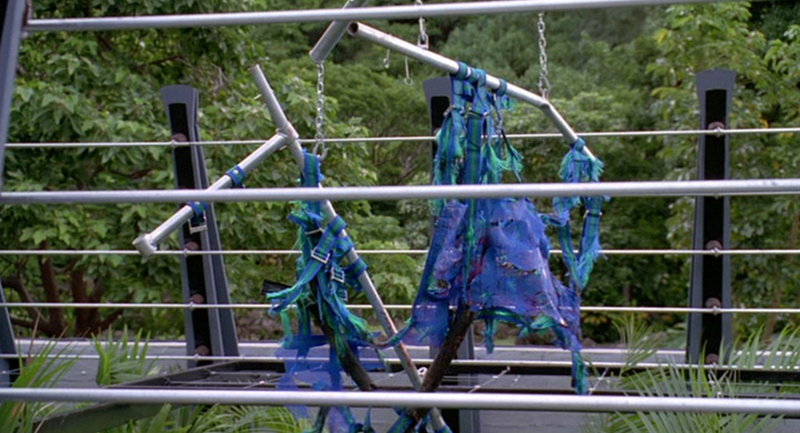 Muldoon later remarked that not even Nedry was foolish enough to have shut off the Raptor fences. 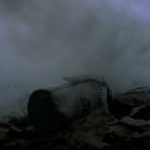 Unfortunately, even though working through the night, Arnold was unable to find and remove the White Rabbit Object command that Nedry used to disable the Park systems. 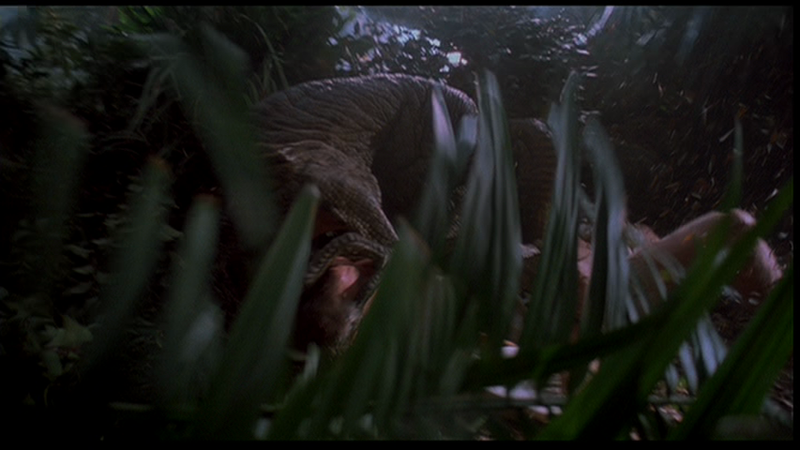 In an attempt to remove the bug in it’s entirety, Hammond had Arnold shut down the entire Jurassic Park system. Unfortunately, the shut down also turned off the Raptor Pen fencing, which allowed the The Big One and her subordinates to escape. 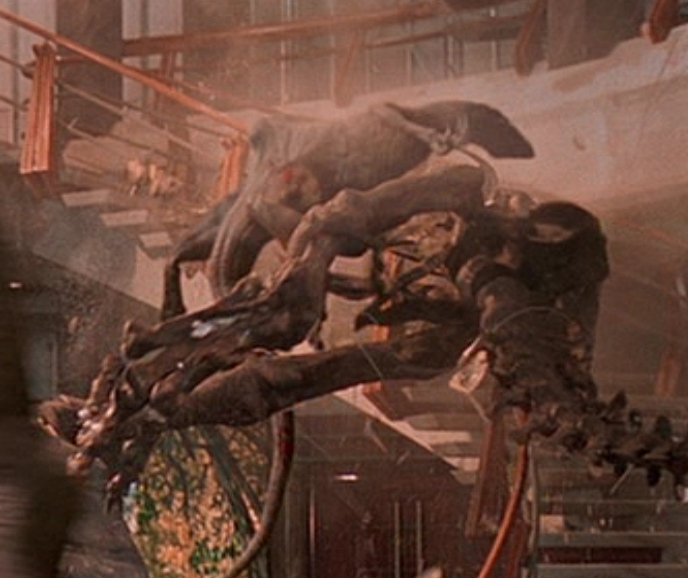 After Ray Arnold did not return from the Maintenance Shed, Dr. Ellie Sattler, accompanied by Robert Muldoon, decided to go to the shed themselves. 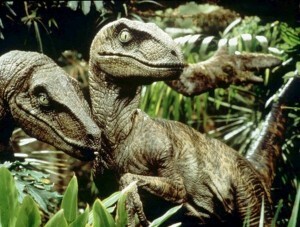 On their way, the duo discovered that the Raptors used the shut down as a chance to break out of the Raptor pen and roam freely. 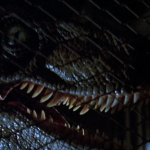 Knowing the Raptors danger, Muldoon had Dr. Sattler make a break for the Maintenance Shed as he attempted to take down the Raptors. Spotting one Raptor in the distance, Muldoon closed in on her and quietly readied his gun. 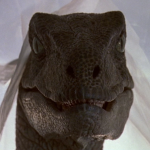 However, as he took aim, a second Raptor ambushed Muldoon and attacked the seasoned hunter just after the man uttered his famous last words: “clever girl”. As Muldoon was mauled, the Raptor being aimed for watched from a distance as a small boa constrictor slithered along the branch in front of her. Meanwhile, Dr. Ellie Sattler had entered the Maintenance Shed and restored power to the Park, only to be ambushed by the third Raptor of the trio. Scrambling back in fright, Dr. Sattler bumped into a machine which caused Ray Arnold’s severed arm to fall on her. 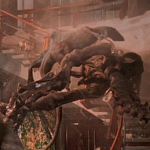 Discovering that the Raptor must have killed and partially consumed Arnold, Sattler was once again ambushed by the Raptor as Ellie made her escape from the building in a frenzied panic. As Grant, Sattler, Malcolm, and Hammond regrouped back in the Emergency Bunker, Lex and Tim feasted out on a buffet that assumingly had been cooked up by Chef Alejandro. 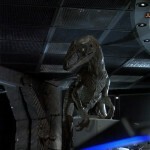 However, the two Raptors that had killed Muldoon have found their way into the Visitors’ Center. 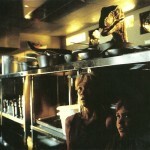 The two children took shelter in the Visitors’ Center kitchen, only for one of the Raptors to follow them in. Calling to her partner, the second Raptor appeared and the two animals began to stalk the children. 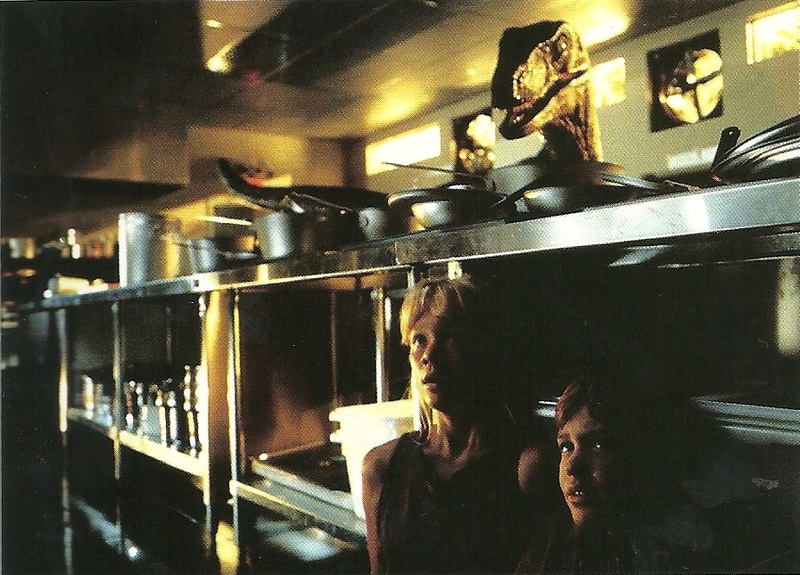 After a short engagement, Tim and Lex managed to lock one of the Raptors in a large walk-in freezer, while the other watched the children flee from the room. 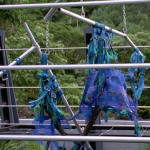 Outside the kitchen, the children encountered Dr. Grant and Dr. Sattler, who took them to the Park control room so the Park systems could be rebooted. As they entered, however, the second Raptor from the Kitchen followed the group, where she attempted to force her way into the the room. Tim Murphy, who stood by in shock, was told by Dr. Alan Grant to get away from the door, and so joined his sister at Dennis Nedry’s computer station. Lex, who was familiar with computers, was able to figure out the system and reboot the door locks, security systems, and phones. With the Raptor locked out, Dr. Grant used the moment of calm to call Hammond and request that a helicopter be sent out to pick them up. However, the conversation was cut short when Dr. Sattler noticed that the Raptor was planning on breaking through the glass wall from the Mr. DNA ride. 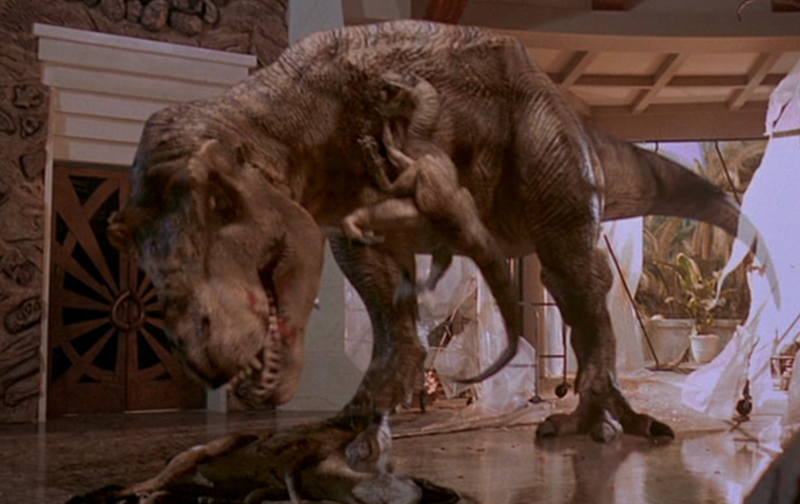 As the Raptor busted through the glass, Dr. Grant tried shooting the animal thrice before the gun jammed. Abandoning the weapon, Dr. Grant instead had the group escape the room through the air ducts. Kicking the ladder away from the gap in the drop-ceiling tiles in hopes that it would dissuade the Raptor from following them, the Raptor instead dismounted from the computer desks she was standing on and jumped through the ceiling tiles where she hung herself from the support beam. Unfortunately, Lex was on the ceiling tile the Raptor had jumped through, and Dr. Grant had to kick the Raptor in the face in an effort to get the Raptor to let go. Letting go of her support, the Raptor fell, bringing Lex with her. Lex was able to be hoisted back up just before the Raptor bit her leg. Following the ducts to the Rotunda, the group found that the Raptor had pursued them there from the control room. Seeing only one way of escape, the group jumped onto the mounted skeletons, only for the Raptor to follow. The mounts, unable to support the weight, quickly began to break apart, and tumbled to the floor, sending the four human and one archosaurian riders along with. As the group recovered from their falls, Dr. Ellie Sattler looked up to find the Raptor that she had encountered in the Maintenance Shed sneaking underneath a plastic tarp that was being used to cover a hole in the uncompleted Visitors’ Center wall. As the two Raptors closed in on the humans, the group was saved just in the nick of time as the second Raptor was about to pounce on her human prey. The Tyrannosaurus rex had come through the hole in the wall, and grabbed the Raptor from mid-air, and crushed it in her jaws. Using the distraction the T. rex provided, the humans fled. Meanwhile, the Raptor that had pursued the group through the Visitors’ Center foolishly attacked the larger theropod. The T. rex snapped at her, but could not reach her. Rolling her head, the Raptor fell into the T. rex’ mouth where she was killed and than thrown against the Tyrannosaurus skeleton and the T. rex let out a mighty bellow. The remains of one of these two Velociraptors were later found by corporate spy Nima Cruz, Jurassic Park veterinarian Dr. Gerry Harding, and Dr. Gerry Harding’s daughter, Jess Harding, when the three had returned to the Visitors’ Center the following morning.